Located on the bank of the Do River, surrounded by green fields, 1 km away from Cua Dai Beach, the Hoi An Riverside Resort is a bit of paradise on earth. Enjoy a bungalow in the heart of Vietnam. All above rates are inclusive of daily American Buffet Breakfast. Rates are subject to 5% service charge and 10% VAT. Vietnamese style room with garden view. All rooms equipped with luxury bathroom with beautiful bathrobes from KhaiSilk, three telephone sets, mini bar, AC and fan, satellite TV and Balcony. Japanese style room with garden view. Larger room with river view. All rooms equipped with luxury bathroom with beautiful bathrobes from KhaiSilk, three telephone sets, mini bar, AC and fan, satellite TV and Balcony. Big room with river view. All rooms equipped with luxury bathroom with beautiful bathrobes from KhaiSilk, three telephone sets, mini bar, AC and fan, satellite TV and Balcony. Dine amid the elegant and refined surroundings of the Song Do Restaurant and delight in the very best of authentic Vietnamese and international cuisine, innovatively prepared by our experienced chefs. Compliment your meal with a superb Chateau Margaux from our well-stocked wine cellar. Restaurant has capacity between 120 to 150 seats with large choice of exquisite cuisines and there is an extensive menu selection to tempt your taste buds. Open daily from 06:00AM to 10:00PM. Soak up all the sunrays you need, cool off with a swim or just laze around with your latest book and a cold thirst quencher. And if you feel a little hungry, just check out our menus for large delicious snacks. Faifo Bar is also a perfect place to escape from the heat of the day, relax with a cup of tea or a snack, enjoy your favorite drink and watch life goes by. A wide selection of cocktails, wines & beers is available. It is the ideal venue for a casual rendezvous. 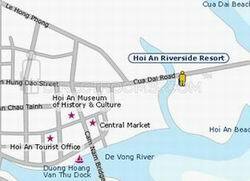 Relaxation and leisure are readily available to you at the Hoi An Riverside Resort. Whenever you prefer to be active or just relax, offering a whole range of sport and recreational facilities to suite everyone. An ancient traditional art, by exerting pressure on specific points of the body and by manipulating muscles and ligaments, the spine is elongated and relieved of tension. The sense of well-being as energy and flexibility are brought back into your body is extraordinary. A traditional Vietnamese foot massage is highly recommended to aid relaxation and promote a sense of well-being. Reflex points, relating to the organs in the body, can be found at the ankles and feet. It is a natural and traditional way to balance the body, stimulate the blood circulation and reduce muscle tension. The traditional way of purifying and nourishing your face using L'Occitane natural products and soft pressure point massage. This relaxing facial treatment will make your skin silky smooth, giving you a fresh and healthy feeling. Our Facial Massage is popular with men and women of all ages.